"I went away a soldier. I came home an outlaw." That's a great quote from Ben Affleck in Live by Night, an underrated gangster film with a few flaws. The film is based on the 2012 book Live by Night by Dennis Lehane. 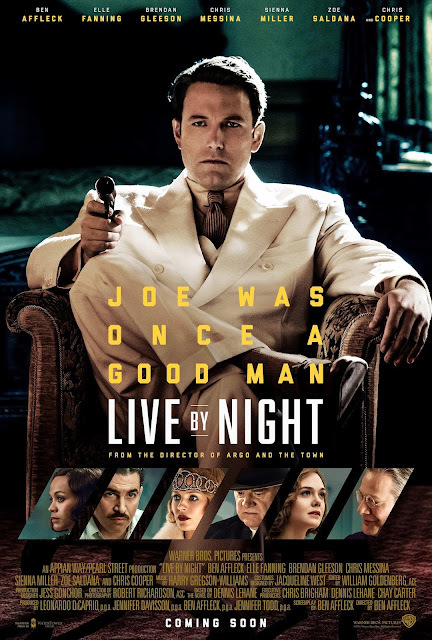 Set over the course of the Prohibition era, Affleck portrays Joe Coughlin, the son of Boston Police Capt. Thomas Coughlin (played by Brendan Gleeson). Joe falls in love with Emma Gould (played by Sienna Miller), the mistress of Albert White (played by Robert Glenister), the boss of the Irish mob in Boston. The Italian Mafia boss, Maso Pescatore (played by Remo Girone), discovers the affair & tells Joe to kill Albert. However, Joe was lured into a trap set up by Albert, & is arrested for the murder of three policemen. After he gets out of jail, he is sent by Pescatore to Ybor City, Tampa, Florida, to help with Pescatore's rum empire. While there, he reconnects with his old partner Dion Bartolo (played by Chris Messina). Joe also meets Chief of Police Irving Figgis (played by Chris Cooper), & his daughter, Loretta (played by Elle Fanning), as well as Graciela Corrales (played by Zoe Saldana), to whom Joe falls in love with. But Joe's acts of violence are about to come back to him, & not how he expected. The cast is great, especially Chris Cooper, one of the greatest American actors in recent memory. Ben Affleck's direction & screenplay is great. The cinematography by Robert Richardson is spectacular. The editing by William Goldenberg is great. The costume design by Jacqueline West is excellent. And the production design by Jess Gonchor is amazing. While there were some problems with the narrative, it is definitely underrated, & proves that Ben Affleck is paving his way to become one of the great American directors.